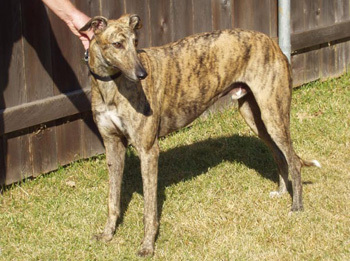 Dodger, aka Soft Dodger, is a handsome big 3½-year-old brindle male born March 27, 2004. His sire is the late famous Gable Dodge, making his grand sire Wigwam Wag, and his dam is Soft Melody. Dodger's racing career consists of 78 races all at the Corpus Christi track starting December 21, 2005 and ending July 14, 2007. Dodger is getting used to life in a foster home and is presently living with two male greyhounds. It is not known at this time if Dodger is small animal or cat tolerant. Dodger is a big (85-plus pounds), sweet, handsome boy who has learned how to throw his weight around - he's constantly cozying up to get his ears and belly rubbed. Your reward is a big grin and sighs of contentment. Everyone who comes to the house is his friend. 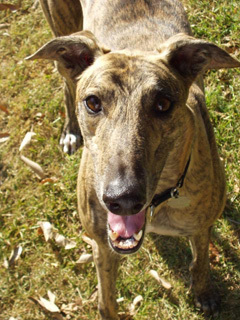 He is learning to play with his two greyhound brothers and enjoys those quick greyhound bursts of activity followed by a long rest. He walks well on the leash and is beginning to respond to his name. He is very curious about "his house" and is still learning what is and isn?t his to play with. He understands "no" quite well when he reaches for something he shouldn't. He uses the dog door like a pro and has done very well (no accidents) overnight while confined in the house, where he stretches out on a dog bed and thumps his tail when you give him a good-night belly rub. He was previously in a house with a young child and no problems were reported.